I’ve had roommates who looked like this guy after a night out at McCormack’s. 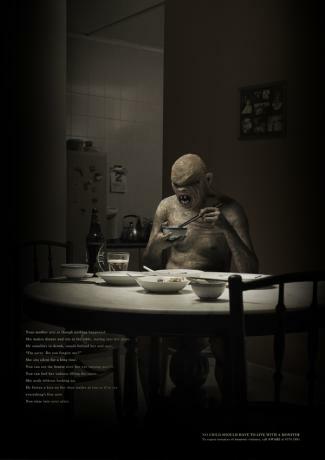 But seriously, the context here is more sobering: It’s a domestic-violence PSA ad from Saatchi & Saatchi in Singapore. (Click the image to see a larger version.) The text reads, “Your mother acts as though nothing happened. She makes dinner and sits at the table, staring into her plate. He stumbles in drunk, stands behind her and says, ‘I’m sorry. Do you forgive me?’ She sits silent for a long time. You can see the bruise over her eye turning purple. You can feel her sadness filling the room. She nods without looking up. He forces a kiss on her then smiles at you as if to say everything’s fine now. You stare into your plate.” Ugh. The tagline is, “No child should have to live with a monster.” See more executions here and here. Via Ads of the World.